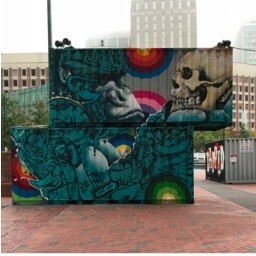 Ruben Gerardo Ubiera Gonzalez is a Dominican neo-figurative artist, known for his use of strong lines, graffiti inspired techniques/esthetics, urban murals, and mixed-media pieces and installations, all created with reclaimed objects and found artifacts. He paints and draws in a style called Postgraffism, but he prefers to call it urban-pop, since he has lived most of his life in urban, populated areas and most of his inspiration is derived from the interactivity of people and their urban environments. Ubiera strives in all his works to capture an essential part of his past, his present, and his subjects through the use of the line and form. His work includes still-life and situational portraiture, but he tends to primarily focus on depicting his immediate urban surroundings and everyday complex human emotions using a strong and expressive line and vivid graphic color contrast, all while adding a mix of youth angst and detailed complexity.